Man. United's Paul Pogba celebrates his goal with a 'cradle rocking' celebration. Paul Pogba celebrated the birth of his first child by scoring a penalty to help defeat Brighton 2-1 at Old Trafford on Saturday as Ole Gunnar Solskjaer became the first Manchester United manager to win his opening seven games in charge. 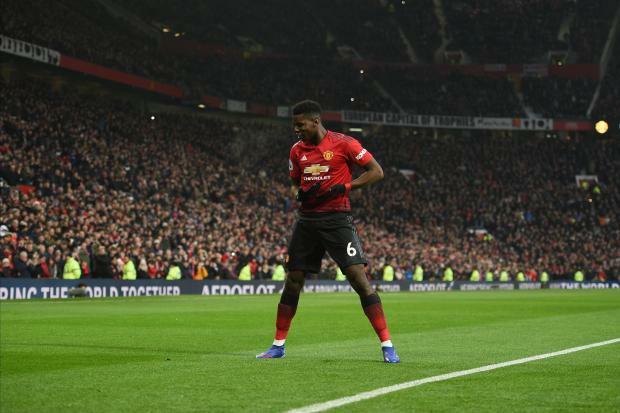 Pogba opened the scoring by winning and converting a spot-kick for his 10th United goal of the season –- equalling his best club total in a single campaign. The France midfielder followed the goal with a 'cradle rocking' celebration -- an apparent reference to his partner reportedly giving birth to the couple's first child. Yet despite an impressive display by Pogba, who almost added a late third goal with a low shot from just outside the penalty area, it was Marcus Rashford's moment of brilliance, three minutes before half-time, that drew the most attention.